Every member of the St. Genevieve High School staff views themselves as a campus minister first and foremost. Whether a teacher of math or science, working in the business office, or principal, every staff member knows that we are called to minister to our students on a daily basis. More and more, our students are beginning to view themselves as campus ministers as well. Sure we have our problems and conflicts, just like any other community. However, what is extraordinary about our community is the desire to know Jesus Christ by finding him in our colleagues and peers. We are constantly challenging one another to teach our faith by living it on a daily basis. We work everyday at creating an ideal Catholic School Community. Putting it simply, our liturgies are sensational. They are moments of real celebrations of faith! We take pride in the fact that we are a school that loves music and we love to celebrate. Therefore, our school masses are usually filled with great energy and enthusiasm. There are many opportunities for students to be involved in the mass ranging from liturgical dancing, gospel reenactments, and helping with the environment. Our student body is known for providing great vocals and the sound of 650 plus students singing their hearts out accompanied by first-class musicians makes mass an exciting experience. 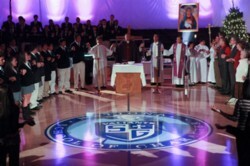 School-wide liturgies take place approximately eight times a year. We sometimes schedule our masses for the evening or for weekends so that parents and the community can be included. 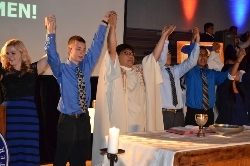 The spirit of the liturgy is due to the involvement, interest, and enthusiasm of our students and staff. Mass at our school is incredible; if you ever get the chance, make certain to attend mass with the Valiants. Retreats are moments that we take to draw back from our normal world in order to know God more and to find Christ within ourselves and in others. 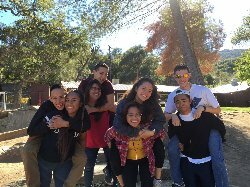 At St. Gen’s each grade level has the opportunity to participate in retreats that focus on growing in faith and unity as children of God. During the school year, every student at St. Genevieve High School - regardless of religious affiliation- will be required to participate and complete a specified number of service hours for his or her Religious Studies course. The purpose is to provide, through personal and community outreach, the experience of God’s grace, which will help students in their faith journeys. Through active participation students will develop new friends, rejoice in discovering talents, experience the joy of giving, and glorify God.